In this horizontal composition Hans Cranach depicted an episode from the story of Hercules which is not particularly heroic in comparison to most of the hero’s labours and exploits. This story had little repercussion in the classical world and the first examples date from the Hellenistic period then reappear in the Renaissance. Having completed his twelve labours, Hercules went to Oechalia where its king, Eurytus, had organised an archery competition whose winner would marry his daughter. Hercules was proclaimed the winner but the king, fearing an attack of madness by the demigod, refused to hand over his daughter. The angry Hercules abandoned Oechalia but stole the king’s cattle. The monarch suspected him but his son Iphitus defended him and went in search of Hercules and the cattle. They met and in an attack of madness Hercules killed Iphitus. As punishment he was sold as a slave by Hermes to Omphale, Queen of Lydia, for a period of three years. At her court Hercules was dressed as a woman and spent his time at female tasks such as spinning and carding wool, and was also Omphale’s lover. In addition, role reversal took place and Omphale dressed as Hercules with the lion’s skin, club and bow. In general terms this subject symbolises women’s control over men. Hans Cranach looked for his inspiration to his father’s depictions of this subject. The present panel, which is signed with Hans Cranach’s initials and dated 1537, was painted in the year of his death in Bologna on 9 October. The similarities with his father’s style are evident in the physical types and the overall execution. Hercules, whose expression suggests that he is not happy with his predicament, is located in the foreground, seemingly seated on a wooden bench. The demigod is flanked by two women who bring their faces close to his, while a third, standing, closes the composition on the right, holding a spindle and making contact with the viewer through her gaze. According to the story, the two women next to Hercules had to dress him as a woman, for which reason the one on the left has placed a wimple on his head, and to teach him to spin, hence the thread that the one on the right passes to him. 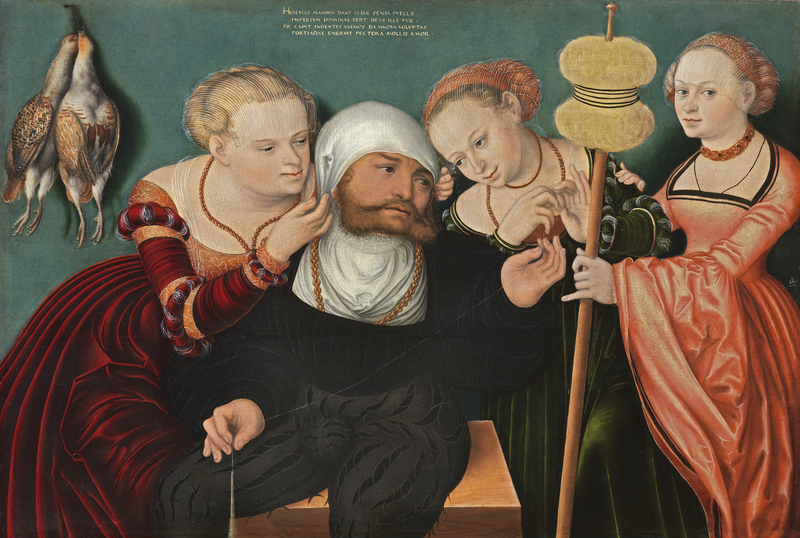 Like his father before him, Hans Cranach set the scene in a contemporary context, dressing the women in court dress with fine velvet dresses and their hair arranged with small headdresses and covered with delicate veils. Apart from the flesh tones and the bright orange-yellow of the figure on the right the chromatic range is dark and intense. Among the versions of this subject by Lucas Cranach the Elder is one that was in the Kaiser Friedrich Museum but was destroyed in World War II. There are also others in which the painter experimented with different arrangements of the figures grouped around Hercules. These versions include the two partridges hanging on the left against the green background and the inscription, both seen here. The partridges are a symbol of lust.